The short video “What is Hemp” describes the extensive scientific research performed on CBD. We are Organic Hemp farmers from Silverton, Oregon and we believe in sustainable farming practices. As our name states, Whole Circle, everything is inter-connected, Soil, Water, and Air. We believe outdoor Hemp cultivation has many benefits. Hemp has a small carbon footprint, Hemp is a water-resistant plant and requires little or no pest management, Hemp cleans the soil and sequesters CO2. Hemp is used in many areas to clean contaminated soil. These are reasons we believe you should know your hemp farmer and where is comes from. We will be certified Organic next year as it is a 3-year process. Hemp is grown from May to October each year and we treat our plants with individual care. We strongly believe in using a whole plant extract where we extract oil from our organically grown hemp and these oils include the CBD along with the Chlorophyll. This oil creates a thick black paste which is used to make our healing products. 3What are known Health Benefits of CBD? The most common benefits are used as sleep aids, anti-inflammatory, and pain relief for joints, back, and neck. There are many studies showing positive treatments for anxiety, epilepsy, fights against cancer, skin ailments and Parkinson’s disease and as an anti-depressant. The health benefits are large and just a quick search on Google will show a mass amount of medicinal effects. 4Will I pass a Drug Test? 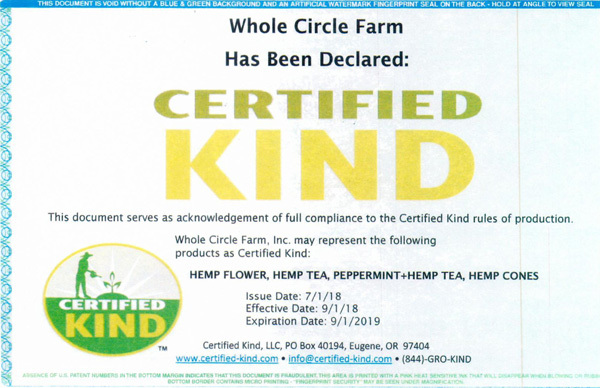 All Whole Circle Farms products do not contain THC (tetrahydrocannabinol) levels higher than .3% THC. We follow all regulations when growing hemp to ensure the THC levels are within the Oregon, Dept. of Agriculture guidelines. CBD is considered to be undetectable in drug tests however it is recommended that all consumers concerned about drug screening to do additional research. 5Can CBD interact with other medications? Always consult a doctor before taking any new products including CBD. 6What Do I need to Know When Choosing a CBD Product? Not all CBD is created equal, at Whole Circle Farms we believe you need to know where your hemp is grown. Hemp can clean the soil from a toxic spill as it absorbs the nutrients. We recommend CBD from an Organic Hemp Crop. We also recommend CBD from a whole plant extraction process. We frown on any products made from isolates. Isolates is a process that is toxic to us and our society. 7What is the difference between CBD and THC? Both the Marijuana plant and the Hemp plant come from the Cannabis species, however they are grown for different reasons. Marijuana produces THC, a psychoactive cannabinoid compound with THC levels from 3 to 50%. Hemp produces CBD, a non-psychoactive compound with THC levels of .3% or below. Whole Circle Farms shall not be held liable for any medical claims. To date no CBD products have been evaluated by the Food and Drug Administration. The efficacy of these products and the testimonials made have not been confirmed by FDA- approved research. These products are not intended to diagnose, treat, cure or prevent any disease. All information presented here is not meant as a substitute for or alternative to information from health care practitioners. Please consult your healthcare professional about potential interactions or other possible complications before using any product.